“Squishy” sold me. 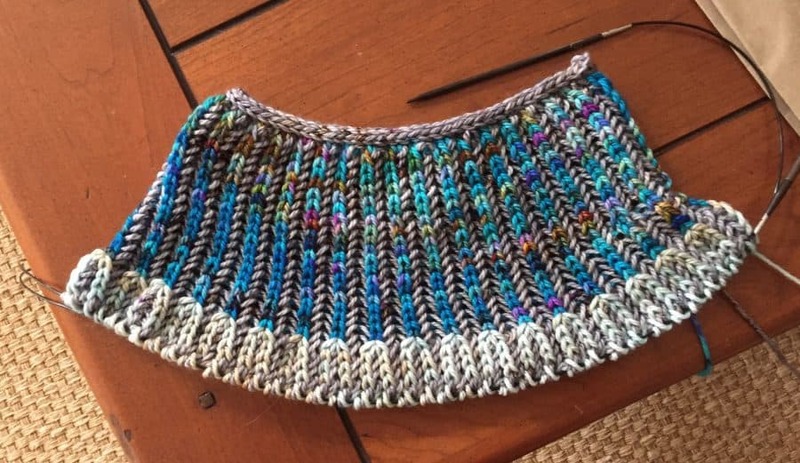 Drew Jacobs (of Neurotic Knitter podcast fame) is making Stephen West’s Briyoke sweater. He kept mentioning that he just wanted to squeeze the fabric. 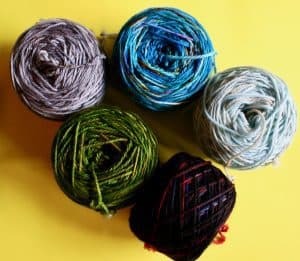 For years as I ventured further and further into knitting, I made sure each new project taught me a new thing. A new stitch pattern. A new shaping for a neck or sleeve. Some way of using a yarn in an innovative way. Intarsia, double-knitting, entrelac, toe-up socks…you name it, I wanted to learn it. Over the last few years, there haven’t been very many techniques that would be new to me, so I’m glad to try out two-color brioche in-the-round! Nancy Marchant…the queen of all things brioche, has a simple description which I have memorized. 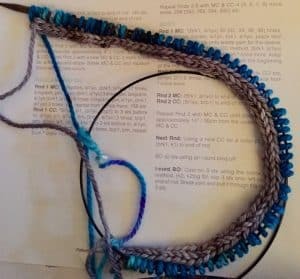 Even though I’m new to two-color brioche knitting in-the-round, I didn’t like Stephen West’s choice of colors in either version he shows. To be more accurate, I didn’t think I’d look good in his colorways. So I chose my own. 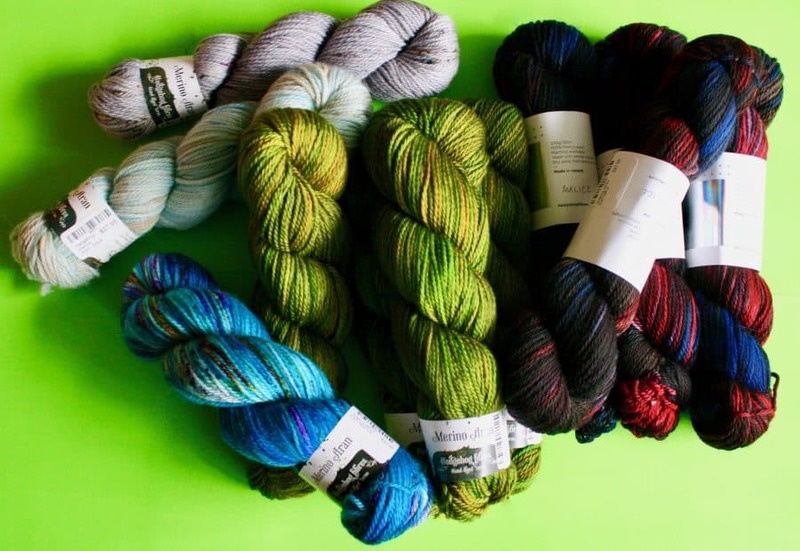 Malice and Swamp (going from left to right) will be my two main body colors and I’ll mix in the other three colors in the yoke and sleeve edgings. I didn’t waste any time in winding these hanks into cakes so I could cast on for Briyoke. This yarn and the resulting fabric is incredibly squishy! After reading up on two-color brioche in-the-round and checking out a few YouTube tutorials, I cast on for the new sweater. Stephen uses an interesting i-cord cast-on edge, which I like a lot. After a few awkward/fiddly movements of my two circular needles, I started to create brioche stitch. 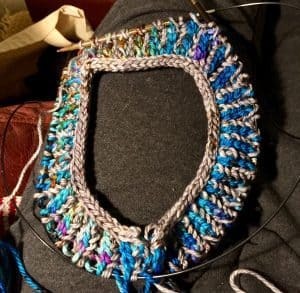 Nobody really explained to me how addictive this stitch can be…I find myself starting to plan my activities around my knitting time with this project! I love the colors I chose for the neck…the two colors from Hedgehog (in case you’re interested) are Construct (the gray cast-on edge and background color) and Deep End (the vibrant blues and turquoises and fuchsias). At this pace, I’m hopeful to have a sweater to wear for New Year’s Day! I dare you to model the finished sweater like the middle image at the top. BTW I like your colors.